STABILO is giving away STABILO Performer to the first 5,000 fans who successfully register themselves with STABILO! The first 5000 fans who successfully register themselves will each receive 2 STABILO Performer pens! This giveaway is on first-come-first-serve basis, 1 entry per participant. The contest is open to all Malaysian citizens except for employees and the immediate family members of the Organizer, Schwan-STABILO Marketing Sdn.Bhd, Swan Malaysia Sdn. Bhd., as well as it's advertising agencies and retailers. FREE sample will be given to the first five thousand (5000) qualified registrations. Each successful registration are entitled for 2 pcs of pen. Each person qualifies for one (1) entry only. All entries to the contest must be submitted to and received by the Organizer on first-come-first-serve basis. The decision is at the sole and absolute discretion of the Organizer and all decisions made are final. No further correspondence will be entertained. Sample will be posted to eligible participants within 60 days after the redemption period. Free samples are not exchangeable for cash and the Organizer reserves the right to substitute and replace the sample with other items of the equal value without prior notice. By participating in this contest, each participant agrees to be bound by and abide to these Rules and Regulations including all decisions made by the Organizer. The Organizer reserves the right to use the Names and Photographs of the winners for any advertising or promotional purpose(s) without any reimbursement or prior notice. 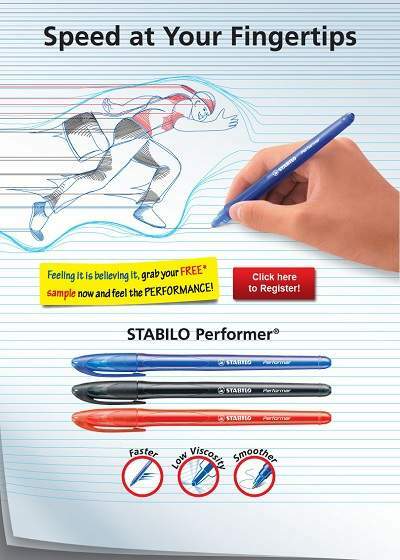 Click here to register for your Free STABILO Performer!